We know that businesses rely heavily on their computer network every day. We understand that when any part it goes down, it can have a devastating effect on productivity. It can even effect your bottom line. Not to mention the stress that it causes your staff and you as the business owner. We are here to assist you with any repairs or upgrades you might need. 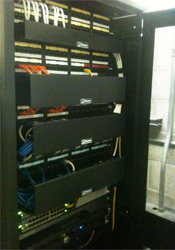 Do you have your network in place, but are thinking about upgrading? Let us take care of that for you. We have a lot of experience in working in Network Administration. We will closely monitor your network to watch for any issues that may come up. You can trust us to keep your business network running smoothly. Maybe you don’t have your network set up yet. We will be happy to meet with you and discuss your company’s specific needs. We can design, build and install a computer network that fits both your needs as well as your budget. We offer both on demand services as well as Monthly Service Plans. Our service plans are tailored made to meet your specific needs. Let us be your Virtual IT Department. Give us a call today so we can discuss your business needs. You can also contact us through our contact page. Make sure to put Business Services in the subject line. My PC suddenly shutdown and wouldn't restart. I had a feeling it was the piwer supply but didn't have a way to test it. Todd told me to bring it in and he would check for free! He was friendly and nice, and confirmed it was the power supply. He saved me as most places wanted to charge me for a full diagnostic and get back to me 3 days later. Went to one of the local tech stores picked up what I needed, and installed it myself. And my PC is running great! Robin C.
I'm so thankful for Tolson Computer Solutions!! Just eleven months after purchasing a new iMac, the hard drive started having issues, and the Apple Store offered to replace it, but they don't do data recovery. Most of my things were backed up, but a few important desktop files were really important to me, and I had neglected to back them up. Todd and Thomas immediately dispelled my fears and then worked hard over a few days to get a full back-up of my hard drive. . . . . . . Amy G.
I was having some problems with my laptop. I brought my computer in and both Todd and Thomas fixed my computer and I was able to go home and start using it with out any problems!!! I would highly recommend Tolson Computer Solutions... Mike C.
I came to Todd with a failed hard drive. I thought I had lost everything. But somehow he managed to get my pictures and many other folders back, when Dell told me it was useless to try and it would be way to costly, they were wrong. I will recomend Tolson computers to all my family and friends, its a great family run business. . . . Diane B.
I brought my laptop in to TCS praying for a miracle, and that the repairs would cost less than $180..... I walked out of TCS VERY happy with my now-working-again laptop and paid less than $60!!!!! If you need repair work or any other Computer/Server/Network services - CALL TCS FIRST!!! . . . . Carl A. These people are incredible! I have never been disappointed in his (Todd) service, his prices. They understand the customer. If you try them for your next computer problem you won't be sorry. . . . Kermit C.
Fantastic service from Thomas at Tolson Computer Solutions! Knowledgable and professional. He was quick and the rates were very reasonable. . . . Scott M.
These people are great. I spilled Mt. Dew all over my laptop. I took it in and they fixed it for a very fair price. -Good prices -great customer service -Friendly . . . . Christie D.